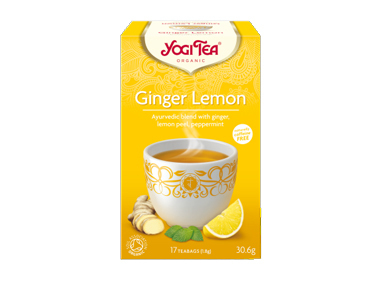 Buy Yogi Tea ® Ginger Lemon Tea - 17 tea bags in the UK from our online shop or directly from our independent Scottish store. Yogi Tea ® Ginger Lemon with the spicy taste of ginger warms the heart and lifts the spirit. The fruity, tart taste of lemon refreshes the mind and invigorates the soul. Hints of lemongrass, liquorice and black pepper add a light, spicy sweetness. Always delicious, this tea refreshes in the summer and warms in the winter. The essence of this tea is: ‘Optimistic new beginnings’. As official Yogi Tea stockist, we sell genuine Yogi Tea directly from our shop in Scotland and online throughout the UK. View more products from Yogi Tea. Where can you buy real Ginger Lemon Tea safely online? If you are wondering where you can buy Yogi Tea ® Ginger Lemon Tea - 17 tea bags safely online in the UK, then shop with us. We are an actual health foods shop; with real people selling real foods and products. Our award-winning independent shop is located in Stirling, Scotland since 1976. You can buy our Ayurvedic teas and other genuine Yogi Tea in store or safely place an order with us online or over the phone. Ginger Lemon Tea - Yogi Tea ® Ginger Lemon Tea - 17 tea bags in Yogi Tea and Herbal Teas.